X-ray plateaus of GRBs are widely believed to be due to theenergy injection into the external shock.Very recently, Liang Li (PMO visiting scholar) and Wu Xuefeng leaded a collaboration to systematically analyze the Swift/XRT light curves of 101GRBs having plateau phases and known redshifts (before 2017 May). Since a maximum energy budget(～2×1052erg) exists for magnetars but not for black holes, this provides a good clue to identifying the type ofGRB central engine. They calculated the isotropic kinetic energy EK,iso and the isotropic X-ray energy release EX,iso for individual GRBs. Three categories have been identified based on how likely a black hole harbors a central engine:“Gold” (9 out of 101; both EX,iso and EK,iso exceed the energy budget), “Silver” (69 out of 101; EX,iso less than the limit but EK,iso greater than the limit), and “Bronze” (23 out of 101; the energies are not above the limit). This work also derives and tests the black hole parameters with the Blandford–Znajek mechanism, and find that the observations ofthe black hole candidate (“Gold”+“Silver”) samples are consistent with the expectations of the black hole model.Furthermore, they also tested the magnetar candidate (“Bronze”) sample with the magnetar model, and find that the magnetar surface magnetic field(Bp) and initial spin period (P0) fall into reasonable ranges. 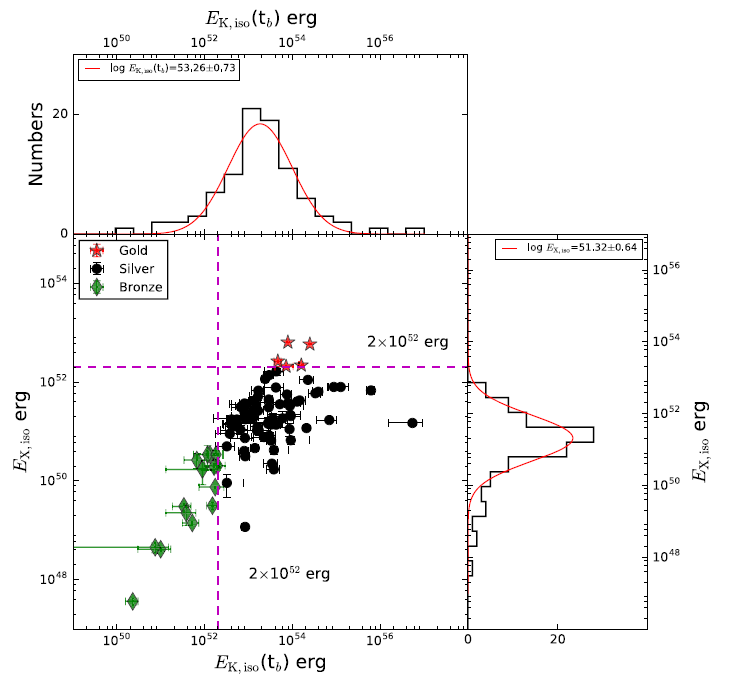 This analysis indicates that if the magnetar wind is isotropic, a magnetar central engine is possible for 20% of the analyzed GRBs. Formost GRBs, a black hole is most likely operating. Figure 1.EX,iso compared against EK,iso(tb) with their distributions (black solid lines) and the best Gaussian fits (red solid lines). Different colors of scatter data pointsrepresent the different subsamples (Gold, Silver, and Bronze). Two dashed lines represent EX,iso and EK,iso(tb) equal to 2×1052 erg, respectively. This work by Liang Li, WU Xuefeng , LEI Weihua Lei, DAI Zigao, etc. has been published in The Astrophysical JournalSupplement Series. Please seeApJS,236, 26 (2018) for more details.